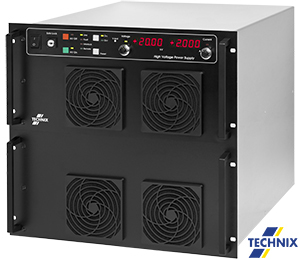 Technix designs and manufactures a wide range of high voltage DC power supplies and capacitor chargers, which span from 1kV to 350kV and from 300W to beyond 500kW. 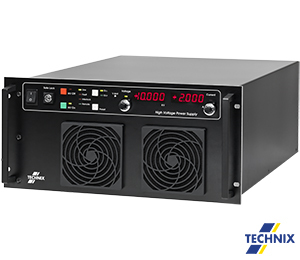 Technix generators are used all around the world, in many major industrial groups and important research laboratories. 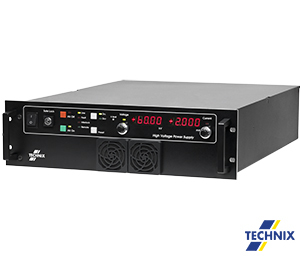 Based on the zero current switching (ZCS) resonance technology, the modular design and wide range of options allows for flexible and customised solutions, while maintaining high reliability and fast delivery. Parallel operation allows increased maximum power. The design also includes a 4½ digit display as well as a Voltage limitation function. Typical Applications: Burn-in and dielectric tests, Molecular Beam Epitaxy (MBE), electrostatic application, leakage testing, DC plasma application. Typical Applications: Ion sources, DC magnetrons sputtering, Semi-conductor manufacturing equipment, Pulse Forming Networks (PFN), X-Ray systems supplies. Typical Applications: Static CUS ; inverters, converters, power eletronics, HVDC grid, Automated Test Equipment (ATE). Typical Applications: Sterilization, capacitor charging (tests), High energy physic application, Lasers systems. Typical Applications: Pulsed power, Marx generators, High Power Microwave (HPM), Flash lamps, YAG lasers.